It’s time to funk it up. When you think of interior design, the first materials that usually come to mind are wood, marble and even glass. But if you’re looking to make a statement and try something non-traditional, there are a few other materials you should consider to make a design statement. Because being boring is…well, boring. 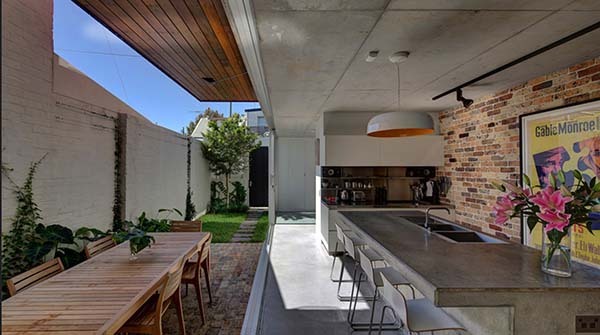 Concrete isn’t just for driveways. Because it’s extremely durable and versatile, it can be used for so many types of projects – from countertops to bookcases and even bathtubs. Although it’s mainly seen in urban areas, it can give a modern and minimalistic feel to almost any design style. An added bonus is that it’s easy to clean. Additionally, concrete can be stained or painted to match perfectly with your space. Easy to maintain and having a long lifespan we’ve been seeing this low cost material in interesting places like restrooms and cabinets, and even as wall and ceiling accents! As a statement feature in your space you can go from many different aesthetics from futuristic to rustic. It makes for a unique accent wall or outdoor design detail. We love seeing copper piping used in hardware. Pops of metallic are totally in for 2018 and using this material is a great inexpensive way to stay on trend. You can find thousands of uncomplicated do-it-yourself projects online to easy incorporated it in your home. We found these amazing copper pipe chairs and stools for our Westlake client to bring some cool metallic warmth to the room. For those looking for a modern vibe, unfinished surfaces add a simple element to enhance the look (without breaking the bank). Unfinished wood furniture pieces and accent walls like exposed brick creates a unique focal point for a room. Try an unfinished wood mantle to step up your fireplace game or a live edge wood table for a stunning dining room centerpiece. This clear material can be used everywhere and anywhere. It adds an interesting element to any space and will most definitely won’t overpower the area. A Lucite piece could work in a room with modern OR traditional design elements and is a perfect accent piece for a room that might already have a lot going on. Looking for help adding non-traditional design elements to your home? Contact us for a free consultation today!